The winters in U.S. Department of Agriculture plant hardiness zone 5, with temperatures to 20 degrees below zero F, test the mettle of shrubs. Used for such applications as brightening up a dull building foundation or planted in groups, these evergreen types for landscaping within the zone come in a variety of species. Some are broadleaf evergreens, flowering during part of the growing season, while others are needled evergreens. Most kinds of evergreen azaleas cannot grow in a zone colder than USDA zone 5. Cultivars of the evergreen azaleas Girard's Fuchsia and Martha Crimson, flowering during April and May and growing to manageable sizes between 3 and 4 feet high. Another azalea cultivar, White Cascade, has white May blooms and works well in groups, as a specimen plant or in woodland gardens, since it handles shady sites. 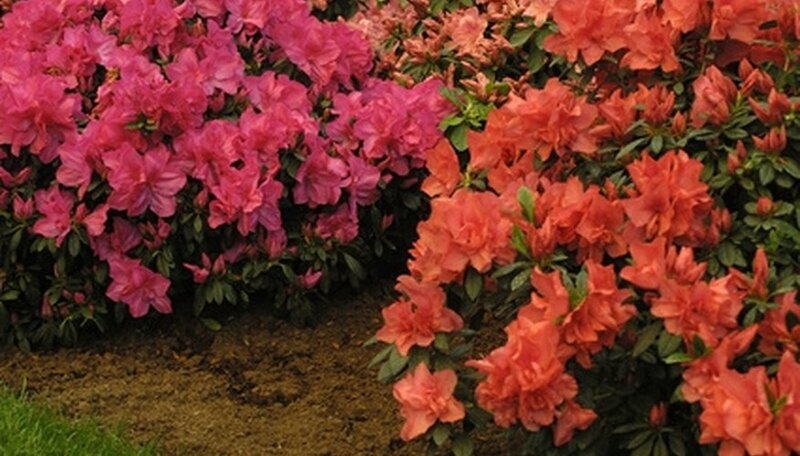 Atlanta is a cultivar of the torch azalea for zone 5 known for its vibrant purple-red flowers and green leaves. The Ilex genus contains many types of hollies that are evergreen and grow under the conditions dictated by USDA zone 5's climate. One is American holly, a tree with several cultivar forms that are either small, such as Maryland Dwarf, or large shrubs, like Williams Hawkins. The former grows to 3 feet, but the latter can be 15 feet high. Blue Princess is a female form of a holly hybrid called blue holly, featuring blue-green foliage attached to purple stems, giving the plant plenty of winter color when combined with its red berries. Compacta is a female inkberry shrub, growing to 4 feet and useful for landscaping in wet areas. In its native Japan, a hinoki cypress may grow to 75 feet, but the cultivars of the tree in shrub form, like Hage, may be as tiny as 18 inches. This makes them suitable as bonsai specimens or appropriate USDA zone 5 for rock gardens. Nana Gracilis is a cultivar to 8 feet featuring dark green needles. The Japanese falsecypress is a slow-growing evergreen shrub; the Lemon Thread cultivar takes as long as 20 years to grow to 5 feet high. This type has brilliant yellow needles and orange-red bark. Shady USDA zone 5 spots support the growth of the Canadian hemlock shrubs derived from the much larger parent tree. Brandley grows from 30 to 36 inches tall and features the same flat evergreen needles. Brandley remains small enough to be a rock garden shrub, but cultivars such as Bennett, to 5 feet high, work in shrub borders and in mass plantings. Geneva, Jervis and Jeddeloh are other cultivars of this evergreen. Jeddeloh has the alternate name Bird's Nest Hemlock from the small depression that often develops in its center.